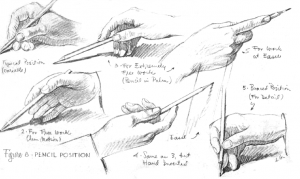 Your hand position will depend largely on the placing of your paper — whether it is vertical, steeply sloping, or nearly flat — and on the technical requirements of your drawing —whether it calls for sweeping strokes, carefully executed lines, or what. 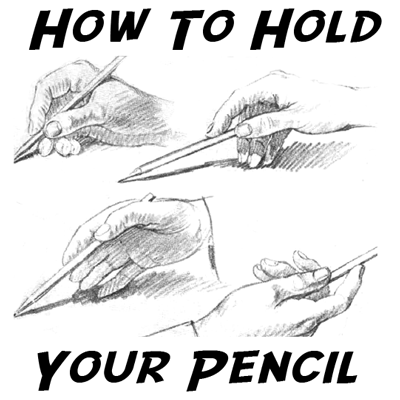 For typical work, most artists hold the pencil much as for writing, with the hand resting lightly on the table (See Picture #1), though they use the pencil with far greater freedom. For short strokes, and strokes demanding considerable pressure, little arm movement is needed ; the hand may swing at the wrist, or the fingers alone may perform the necessary motions. For longer strokes — notably quick, dashing strokes — the pencil is more likely to be held well back from the point, and often the entire forearm and hand are swung freely from the elbow, with a minimum of wrist and finger movement (See Picture #2). For particularly unrestrained effort, such as that required by the quick blocking in of the construction lines of a subject (especially if one is engaged at an easel or on drawings of large size), the pencil (which should preferably be of full length) may be held with the unsharpened end in the palm (See Picture #3), the hand and wrist being very boldly swung. The hand may even be inverted (See Picture #4) ; this position permits amazingly rapid progress. I agree. Maybe some people find that drawing this was makes you better, but if you’ve been drawing differently for your whole life, it’s very hard to suddenly change the way you hold your pencil or pen. Everyone fonds there on comfortable way of drawing not everything you read is true.